Villefranche is located in the south of the Dordogne on the border of Lot and Lot-et-Garonne and is part of the Perigord, synonym for food, drink and enjoy. It is a medieval Bastide village with shops, cosy bars and restaurants. 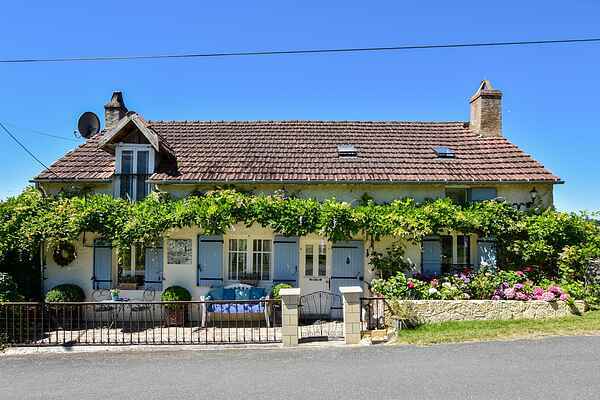 On the south side of this bastide sits this beautiful, authentic French house, with a great view, that has been renovated with a lot of taste and gives a feeling of coming home. This holiday home has a large kitchen-diner which is very well-equipped and gives access to the large covered terrace. From there you go via a small staircase to the adjacent swimming pool which is nicely isolated on the slope. Inside, in addition to a toilet and a very nice bathroom, there is also a spacious living room with fireplace and another door to the terrace. On the upper floor there are 2 bedrooms. The surrounding area is characterised by vast vistas, forests and rolling valleys. The region is known for its chestnuts, game and mushrooms. But the Cahors wine region is close by, and the river Lot is only 15km away. Enjoy Puy L'Eveque, visit Cahors with its Saturday market, and venture to one of the many food markets.